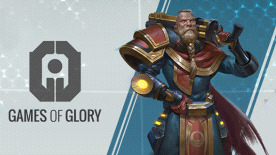 Games of Glory is a top-down team shooter which adds a new competitive multiplayer layer to the genre. In the intense battle arena experience, players must work together in fast-paced matches using a combination of free-aiming shooter mechanics and close combat controls. Battles consisting of 5v5 or 3v3 players play out across a variety of modes and maps where a team must defeat the opposing team by completing objectives or destroying their rival's core. Set in a sci-fi universe, the Games of Glory are futuristic gladiator games created by the Synarchy, a powerful intergalactic empire, where they act as the main source of entertainment and resolution of conflicts for inhabitants. The storyline and world of Games of Glory will evolve and shift as Champions and factions true agendas, be it riches, fame or political influence, are revealed. In battle, players will assume control of a Clone, each with its own set of three unique skills and from one of five classes - Tank, Scout, Support, Assassin, Carry. Players can equip and upgrade 50 non-character specific weapons including shotguns, rifles and melee weapons, that can be used to strategically overpower their opponents. Friends can create their own Clubs, or join one that is recruiting, and head into battle together with custom skins for their teams. Games of Glory © 2014 Lightbulb Crew SAS. Games of Glory and its respective logos are trademarks or registered trademarks of Lightbulb Crew. in the United States of America and elsewhere. All rights reserved. All other trademarks and trade names are the properties of their respective owners.